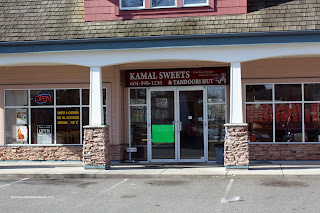 Alright, the first time I visited Kamal Sweets and Tandoori, my mission was to get a whole whack of samosas. I make the drive out there, get out of the car, take my camera out, turn it on and *click*... Hey, WTH? For the love of... I forgot to put the battery pack in! The horror! Fine, my bad. 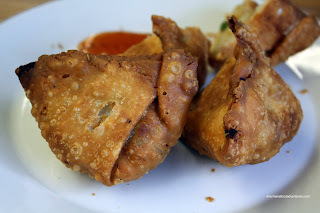 I still got the samosas and they were pretty darn good. You know what made them even better? The veggie ones are only 2 for $1.00. Yes, this is not a misprint. For the price of a Snickers bar, you can have 2 freshly made samosas! Since they also are a sweets shop and restaurant, I made my way out there once again to try some of their food. I was there at the start of lunch; but apparently, the cook wasn't in yet and thus, no lunch! Ack! No battery last time and no lunch this time. 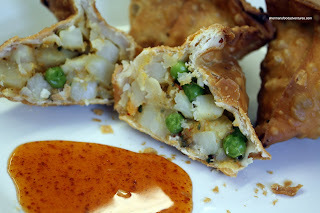 Fine, I inquired about getting samosas once again and yes, they have someone who could operate the deep-fryer. Approximately 10 minutes later, I was presented with my order of 20 veggie samosas. It only cost me $10.00! Relax, they weren't all for me. I was sharing them! One particular individual who was lucky enough to get some of these tasty treats is Indian and confirms their authenticity and deliciousness. What makes them so good? Well obviously the price first of all. Moreover, as you can see, they have a nice colour to them and are not overly oily. Also helping the cause is that the pastry is quite thin, making it easy to eat. Inside, there is plenty of potato and peas spiced up by curry. Not packed too tight, otherwise it would be a clumpy mess. Dipped into the provided tamarind sauce and you have so darn good eats. - No chef to make lunch?